If you’re on Instagram, you NEED to follow @dailyfoodfeed. It’s literally a feed of delicious food. Need I say more? A guy named Edmond runs this particular gram feed and he was kind enough to answer a few Qs about it! Where did the inspiration to start this instagram come from? How long has it been up and running? I actually run a marketing agency called Taste Marketing Strategies. I manage my clients’ Instagram accounts daily, but I wanted a foodie account with my own voice, and not my clients’. I also love keeping up with food trends and new, interesting eats so I can be a resource to my clients on their menus. Because of this, I look through A LOT of food photos on Instagram and wanted to give my favorites a home where I can repost and refer back to them. The main inspiration for @dailyfoodfeed is my absolute love of food. Here’s the crazy part… I only started @dailyfoodfeed about 9 weeks ago and have about 9,500 followers. I never expected such a large following so quickly! How do you think you’ve gained such a large following so quickly? Being such a new account, I’m still figuring this out every day, but also used my experience with my clients’ Instagram accounts I manage in the strategies I used to help gain a following. There isn’t an exact recipe, but I think it’s a good combination of things that help make @dailyfoodfeed successful. One thing I know is important is a good user name. Then, of course, there are the photos! I strive to post really engaging photos that get people talking and tagging their friends. We also further edit photos, if necessary, to fit the overall image and quality my followers expect from the feed. I also think my captions help. I like having fun with them, but I also make sure that my followers get all the information they may want. Another big thing I’ve found that has helped has been connecting and networking with other great foodie accounts. I’m finding it to be a great community of Instafoodies! Are all of the posts your own? Do you take submissions? Most of the posts are not my original photos and we do absolutely take and welcome submissions. I post the occasional original photo here and there, but I really wanted this feed to be about the interesting eats you can find throughout the world of Instagram. Unfortunately, I can’t just pick up and travel around taking Instagram photos of an interesting burger I know of in New York (We’re based in Orange County, CA)…. YET 😉 So, in the meantime, I research some of the foods I’d like to feature and also, now, have a great community of Instagram users who use the hashtag #dailyfoodfeed to be featured. You post SO so many delicious looking foods, but do you have a favorite that stands out? That’s hard to pick because every day I post a pic, I think there is a favorite in there. My most rewarding are, of course, the originals we produce, but I also love the reposts we have done from accounts that don’t get a lot of exposure and go completely viral and reposted by other accounts because of us. It’s really cool to see this happen! Is there any food you absolutely don’t like/won’t try? I’d literally try ANYTHING. I have this weird hate for black olives, but still don’t mind it if it makes a dish better. Many thanks to Edmond! Happy eating, y’all! DUMBO, Brooklyn: Down Under the Manhattan Bridge Overpass (aka my new favorite place). Having difficulty choosing a snack? Chips or ice cream?!? Oh, the struggle is REAL. How about BOTH!? 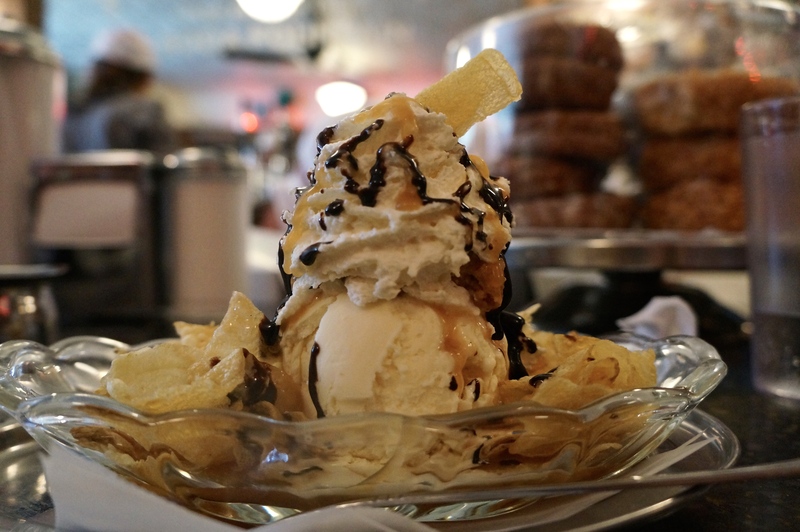 Yes, I’ve already reviewed Brooklyn Farmacy…but it’s just too good to not highlight again. On my most recent venture to Brooklyn, I brought my friend Kelsey (who was visiting from Florida) to the ice cream shop that has stolen my heart taste buds. Kelsey and her “Cookie Monster” Sundae! So much goodness in one place. I’m not sure I could ever go to Brooklyn and not end up at the Farmacy. I love it too much. Also, I discovered something new – they have half-size sundaes (which is what Kels and I opted for after eating some delicious sandwiches)! The Mr. Potato Head was incredible. Salty and sweet. Vanilla and peanut butter. And chips. And chocolate. And caramel sauce. And diabetes….well I mean, if you ate this every single day. For every meal. All the time. Maybe. A view of Manhattan from BK. Perhaps one day I’ll call Brooklyn home, but for now I’m not sleeping till I go back. I’ll leave you with a photo series I’d like to call: Awkward Poses with Kelsey and Jackie. Cafeteria Boston – 279 Newbury St. – not actually a cafeteria. good, fresh food. Chicken Lou’s – worth the trip to Northeastern’s campus where this little shack lives…you’ll want to order the TKO. Conor Larkin’s Grill & Tap – basically on Northeastern’s campus – really good ‘black and blue’ burger – oh, and they have a shotski. J.P. Licks – A delicious ice-cream chain unique to Boston, you’ll find flavors like Banana Cookies ‘n’ Cream, Peanut Butter Cookies ‘n’ Cream and Coffee Cookies ‘n’ Cream…they have a bunch more but I love the variety of Cookies ‘n’ Cream! Mike’s Pastry – well-known Italian bakery – 300 Hanover St.